The ATS657 includes an optimized Hall-effect sensing integrated circuit (IC) and rare earth pellet to create a user- friendly solution for direction detection and true zero-speed, digital gear tooth sensing in two-wire applications. The small package CAN be easily assembled and used in conjunction with a wide variety of gear tooth sensing applications. The IC employs patented algorithms for the special operational requirements of automotive transmission applications. 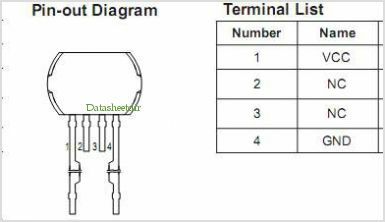 The speed and direction of the target are communicated by this two-wire device through a variable pulse width output protocol. The advanced vibration detection algorithm systematically calibrates the IC on the initial teeth of a true rotation signal and not on vibration, always guaranteeing an accurate signal in running mode. Even the high angular vibration caused by engine cranking is completely rejected by the device. By Allegro MicroSystems, Inc. This is one package pinout of ATS657,If you need more pinouts please download ATS657's pdf datasheet. 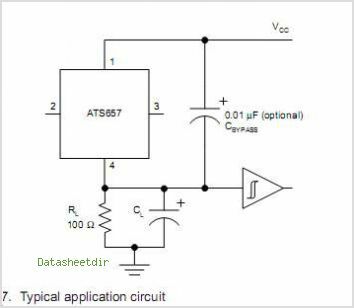 This is one application circuit of ATS657,If you need more circuits,please download ATS657's pdf datasheet.